Apparently, carrying around your junk is no longer enough. If a group of Dutch entrepreneurs have their way, your bag will do everything from charge your laptop to remind you when you leave it at the coffee shop. Called Phorce, its creators are touting it as the world’s first smart bag, designed to fit into your digital life. It includes a built-in battery pack that can charge your smartphone, tablet or other USB-based device through three USB connections. It carries enough of a charge to fully recharge your iPhone eight times. 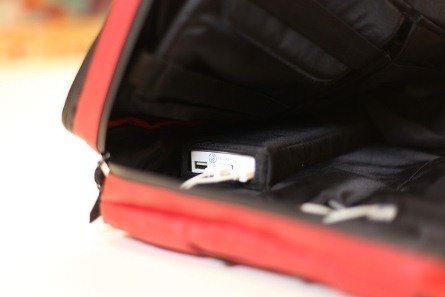 The bag comes with its own Android and iOS-based application to connect your smartphone to the bag, so you can see how much power you have left in the bag. You can receive a mobile notification if you go out of range of your bag, in case you’ve left it behind at Starbucks. The bag can transform into messenger, backpack and briefcase formats, the interior is designed to clean your devices and the exterior is waterproof. The Phorce will be available in black, red and green and weights 3.7 lbs, with a Mac version retailing for $449 (it will also separately charge a Macbook for seven hours) and a USB version for $299. But it’s not available just yet: the creators are looking to raise $150,000 through Kickstarter so it can be released internationally. “Phorce doesn’t just introduce a range of innovative new features, but it does it right. We also combined the best features found in other bags, and actually optimized them,” said Berk. “Phorce’s patent-pending technology is beautifully integrated so it powers, transforms and connects seamlessly. It’s a more advanced, useful, and better-designed bag, making it a complete triple threat in the bag industry.